Bárðarbunga is a subglacial volcano in Iceland responsible for a whole lot of seismic activity this week. If it erupts, it could melt the Vatnajökull glacier and produce impressive downstream flooding. At least the latest Icelandic volcano to catch our eye is a lot easier to pronounce than the last one! First things first: to properly twist your tongue around this name, you're going to want to say something akin to ""b-OW-r-tha-boon-ga" (as suggested by Dave McGarvie), or "Bau-thar-bunga" (as suggested by Ian Stimpson), but neither seem to catch the rolling r quite as well as this handy tutorial by MBL. Alternatively, you can work purely in written formats, and just keep copy/pasting the name on an as-needed basis without venturing into writing it from scratch. 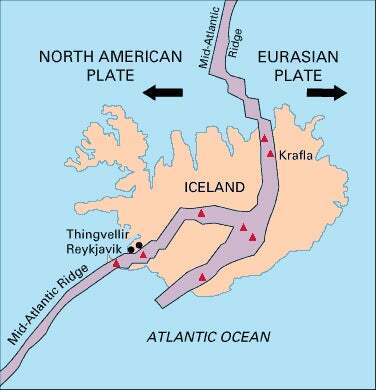 Iceland occupies a strange place as both a hotspot and a continental rift where tectonic plates are pulling apart. Consequently, the volcanoes can defy simple classification, as eruptions can have magmas of variable geochemistry from gentle basalts through explosive rhyolites. To make things even more complicated, the volcanoes can be buried under massive ice sheets, preventing us from examining them easily. One of the key tools for monitoring these subglacial volcanoes is by recording any seismic activity from earthquake swarms. Seismicity under the Vatnajökull glacier has been increasing for the past seven years, with a drop when Grímsvötn erupted. Now seismicity is back to pre-eruption levels, this time in the northwestern region of the ice sheet where Bárðarbunga is located. Bárðarbunga is a more accurately a system of volcanoes, not a single volcano. Its caldera stretches ten kilometers across buried under 700 meters of ice, with fissures stretching southwest and northeast. Some of the fissures are in swarms, or even have distinct crater rows formed over centuries of eruptions. A pair of earthquake swarms near Bárðarbunga were recorded on August 16th and 17th, prompting the Icelandic Meteorological Office (IMO) to raise the volcano's warning level to yellow then orange. It's been sitting one step below the maximum red-alert risk level all week, with continuing seismic activity. Iver 3,000 earthquakes have been detected in distinct clusters, most occuring between 5 and 10 kilometers depth. Presently there are no signs of eruption, but it cannot be excluded that the current activity will result in an explosive subglacial eruption, leading to an outburst flood (jökulhlaup) and ash emission. The situation is monitored closely. No signs of migration towards the surface or any other signs of imminent or ongoing volcanic activity have been detected so far. A flyover of the region on August 17th affirms this undramatic take, with no obvious cause for concern. An Icelandic Coast Guard helicopter flew a team of scientists out to install additional monitoring equipment, including seismometers and webcams. Nothing. Any magma movement never breaches the surface as an eruption. An intrusion is formed, geophysicists get excited, and journalists everywhere roll their eyes at the letdown. A small eruption under thick ice. If not much magma erupts, it may not break through a 400-meter thick ice sheet. If the eruption happens mostly under the ice, the hot lava could melt the ice, producing volumes of water up to 14 times the volume of molten rock. We might be able to observe a depression on the glacier's surface, but more dramatically, all that water will runoff into the river system, causing downstream flooding. A large fissure eruption under thick ice. If a long fissure of magma erupts, it could melt through even a thick ice sheet. This would be a repeat of the 1996 Gjálp eruption, with the lava melting through the overlaying glacier within hours. After breaking through the ice, a small eruption plume would form. An eruption under thin ice. If the magma erupts along the glacial margin, the hot material could generate small but powerful steam explosions in the saturated sediments adjacent to the glacier. After the local water is explosively converted to steam, the eruption would settle into a normal fissure eruption. Former geology consultant, Icelandic presidential candidate, and current science writer Ari Trausti Guðmundsson came up with a very similar list of possible eruptions while writing for Discover Geography. By Wednesday, McGarvie theorized on Twitter that the cluster patterns of earthquakes could be interpreted as lateral dyke formation. This type of formation is common in Iceland rift volcanoes as the island pulls itself apart in fits and jumps over the centuries. The Krafla fires in the 1970s are the most recent spectacular example of this type of event, but only about 1 in 3 of these dykes result in eruption. One of the linear clusters of earthquakes doesn't seem to align with either volcano summit, leading McGarvie to muse that it may be an indication that the magma has hopped over to a weaker area of the rock. Due to the low population density in the region, no settlements are at-risk if the volcano does erupt. However, as a precaution, the Police Commissioner of Húsavík closed all highland roads east of Skjálfandafljót up to Askja along with a few other locations due to the potential risk of a jökulhlaup. This is the region that gave jökulhlaups their name: traditionally, the term included only geothermally-triggered subglacial floods like those regularly produced by eruptions under the Vatnajökull ice sheet. Over time, the term's meaning has expanded to include a wider variety of glacial outburst floods, not just those triggered by eruption-related melting. A flood of water from Vatnajökull would overwhelm the downstream river system. It'd take ten hours for water to flow out to the sea. As it followed the path of least resistance, a jökulhlaup could easily wipe out the only bridge, increase the flow of the already-epic Dettifoss falls, and resume its previously-abandoned task of rolling boulders across the plains. Would this volcano cause the same disruption to aviation as Eyjafjallajökull did in 2010? Probably not. Volcanologist John Stevenson explains, "Every Icelandic eruption since 2000 has affected aviation, but not all cause serious problems." This is due in part to the actual eruption and ash cloud characteristics, but another contributor is also purely procedural changes in aviation industry guidelines about avoiding ash. Since 2010, the industry has moved from a region-closing, "Avoid all ash" mindset to more limited restrictions on areas with the highest ash concentrations. But perhaps most importantly, Eyjafjallajökull erupted for a relatively long time in the perfect weather to maintain aircraft-interfering ash clouds for a prolonged period of time. When Grímsvötn erupted the following year, it produced twice as much ash in a tenth the time, yet had a far more mild impact on air travel as the ash rose into the upper atmosphere and dispersed. Even if Bárðarbunga does erupt, between updated regulations, different weather, and a more typical eruption duration, the ash shouldn't cause nearly as many problems as the infamous Eyjafjallajökull. Right now, the two main clusters of earthquakes are located along the flanks of the volcano, not at the summit. This means that while historically Bárðarbunga has produced some massive eruptions, if it erupts now, it'll probably be a more modest eruption with a mild ejection plume. That this is the start of a major volcano-tectonic event at Bárðarbunga, which may further develop to the southwest. This is a concern because in the southwest there are fissures that have produced Iceland's most voluminous lava flows, since the ice melted some 9,000 years ago. To add to the doomsday scenario, most of Iceland's hydroelectricity is generated in the rivers southwest of Bárðarbunga. If major fissure eruptions start up, it's going to wreak havoc on the power supply. On the up side, Iceland is well aware of this scenario, and even has specific response plans in place if the world starts blowing up. The strangest part of McGarvie's nightmare scenario is that we won't know right away if it's happening. Even if Bárðarbunga erupts (which it might not), we have no way of knowing if it is an isolated incident, or part of some greater prolonged volcano-tectonic episode reshaping the island. In the meantime, about all we can do leave the webcams running, count the downright extravagant number of earthquakes, poke at any other remote tracking data, and wait. Update August 23: A small, subglacial eruption started at Bárðarbunga at 2:10 pm local time on Saturday. See further updates here.